Sincil Bank has host home to Lincoln City since 1894 and has an all seated capacity of 10,130. 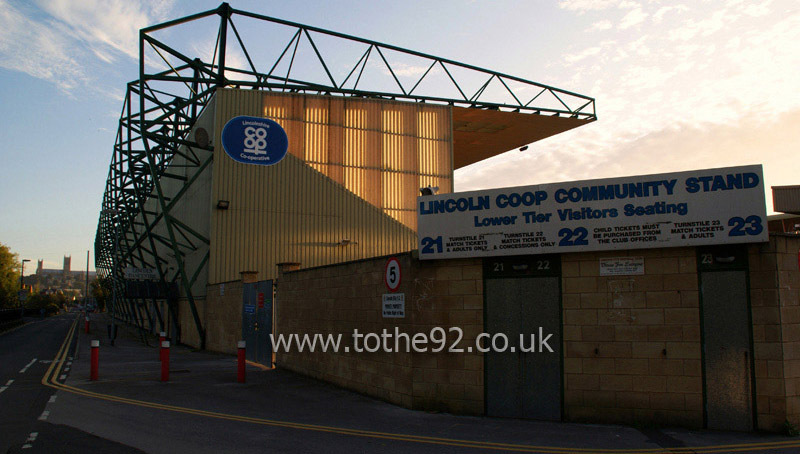 The largest of the four stands at Sincil Bank, which holds approximately 5700 people, is the Lincolnshire Co-operative Stand which runs alongside the pitch and is home to the majority of the Imps' support. Opposite is the Lincolnshire Echo stand which runs about half the length of the pitch. Both stands behind the goals have supporting pillars. However, there are three very prominent posts right at the front of the Stacey West stand where as the Imps stand has only 2 supporting beams and not as prominent. 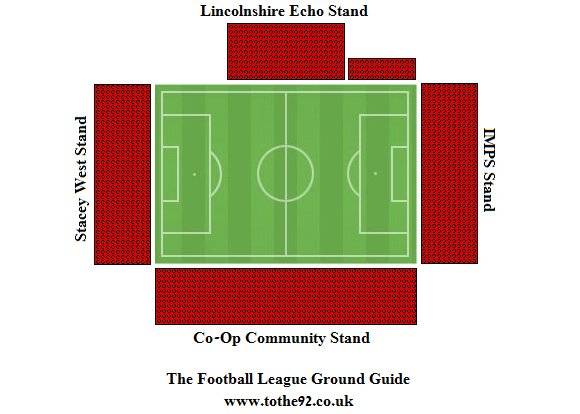 Up to 2,000 visiting supporters can be accommodated here and they are situated in one end of the co-op stand. The view from this stand is un restricted whilst the leg room and facilities are very good. A wide range of food is available at the refreshment outlets including the regular football fare starting at about £2.00. Just in behind the South Stand there is a supporters bar that welcomes home and away fans before the game. You can get a wide range of beers along with hot and cold food whilst watching the early kick off's in the closest proximity of the stadium. Alternatively, if you walk up towards the town centre you'll find many more pubs and fast food establishments within 10 minutes of the ground. Parking is available in surrounding streets, or alternatively, South Common is open for parking. This can be found at the beginning of South Park Avenue when coming in from either the A46 or from the High Street. It's free to park and only about 5 to 10 minutes walk from the ground. The nearest / closest train station to Lincoln City's Sincil Bank Stadium is Lincoln Central, which is around a 15 minute walk from the ground. To get to the ground on foot from Lincoln Central turn left and then left again at the main road (High Street) going over the level crossing. take the seventh turning onto Scorer Street and then the first right into Sincil Bank. Travel: Its a lovely scenic drive! Motorway all the way as far as Scunthorpe, then the A15 for about 20 miles. Its hard to find the ground once you get into the city, its very close to the centre, but the parking is ridiculously good! I've never been to a ground so penned in by houses, yet so free of parking permit zones! Arrived just under an hour before kick off, yet still an absolute embarrassment of riches to park in, despite it being all street parking, bar one car park at the ground! Refreshments: The city centre is less than half a mile away, so a ton there. Inside the ground, the usual overpriced stuff. Had a steak pie, which was alright, though as difficult as hell to eat since they didn't have forks! There is also the Supporter's Trust bar at the back of the South Park Stand, which was a great little bar. Massive inside, big screen showing the live games, two bars and plenty of tables. Impressions: I was in the biggest stand, and the only one without any supporting pillars, the Community Stand, which is shared with away fans. The ground is all seater, with two shallow stands behind each goal (with boxes at the back of the South Park Stand) and then the very old fashioned Main Stand which only covers the central area of the pitch. Atmosphere: For most of the game, it was only really the Stacey West Stand giving it some, though they were pretty incessant all day! The whole ground joined in a bit more after the 3rd goal, so not too bad overall. Couldn't hear the Hereford fans from the other end of the ground. Anything Else: The Stacey West Stand is named after two Lincoln supporters who died in the Bradford Fire in 1985. Enjoy: Quality little ground. Spot on for location, decent bunch of fans, got everything you need really! Have you been to Lincoln City's Sincil Bank? To tell us about your experiences and to feature on the site, simply complete the fans review form below!